A memorial honoring the trees cleared for new construction at the Goodwin House, Transitional Reflections is an intensive study of craft and illusion. From the entrance to the Goodwin House Knoll Garden a willow oak was the ‘selected’ timber. A fork in the tree became the aesthetic focus. A vertical slice to the fork exposed the interiors. This led to stacking the opposing cuts creating an elliptical form. Shaping and sanding revealed its exquisite patterns and tones. 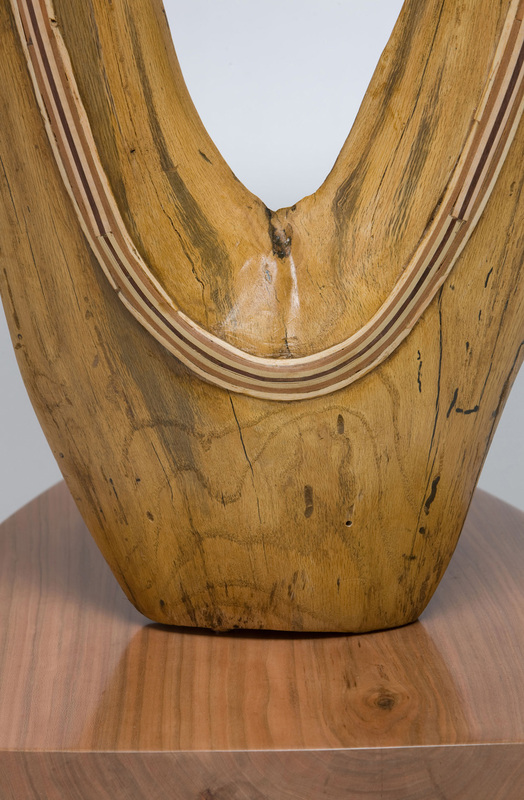 Bonding the stacked pieces with half lap joints, the sculpture was reinforced with repetitions of oval inlays and laminated bands of ash, cherry, maple and walnut. A fine polish brings out the luster and invites one to explore the deep richness of the smooth grained surfaces. On the opposing side, Smith-Bügge expands the examination of the rough-torn interior of the oak with reflections from an inlaid glass mirror. Shingled areas hide a secret, and other imperfections can be found. 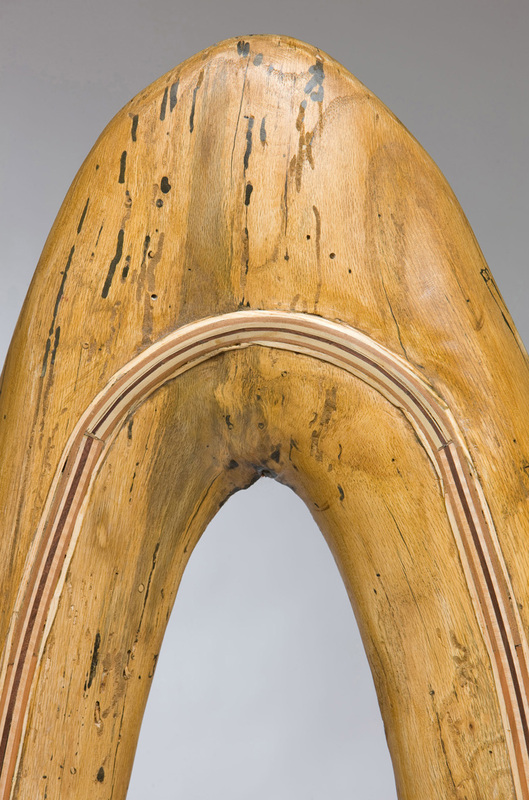 This opposing frame creates an illusion that is a repeated ellipse carved from linden. A finely finished cherry base conceals engineered steel supports. The hand-carved bridge on top connects the oak and linden ellipses. Transitional layers of illusion entice viewers to reach into the reflections and imperfections of the oak, mirroring our own imperfect by complex lives. A sculpture stately as a tree. So prayerfully toward the sky. A mandorla carved from a tree. See video of Transitional Reflections on Résumé page.